Sharp is known more for its advanced LCD screens than as a maker of smartphones. But the Japan based tech firm surprised the world when it announced in 2015 that it would soon launch a smartphone capable to walk and talk. 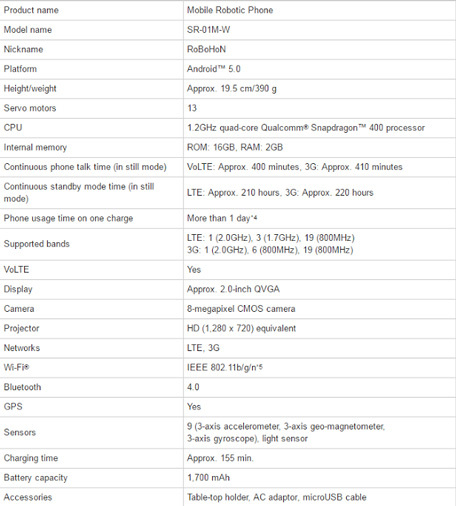 The company has now announced that the smartphone is ready for retail and will start selling from May 26 for $1800. The company has named the device RoBoHoN and said it would be the world's first mobile robotic phone. This humanoid robot can walk on two legs and is compact enough (approx. 19.5 cm tall) to be carried almost anywhere. The device can perform all basic functions that a mobile phone can do and also act as a projector, displaying photos and videos on to a screen or a wall. "RoBoHoN has all the basic mobile phone functions, such as phone, e-mail, and camera, as well as a range of services accessed through dedicated apps, all of which are used by conversing with this humanoid. A newly developed built-in compact laser projector*2 with focus-free operation allows users to project photos, videos, and maps onto a screen or wall," the company said in a note. Sharp's strategy is that the device can learn from its user's behavior and adopt to various circumstances. There are multiple dedicated apps that are being built that will expand the functionalities of the device. The phone can walk up to your bedroom and wake you up and then follow you to the living room as you get dressed, reminding you of the various appointments, it can even follow you to the kitchen suggesting ideas for breakfast and how to make a healthy one. In office it can be placed on your desk and even instructed not to move around the work place. There are office related apps that will make it your office and personal assistant. "Users can also download dedicated apps to give RoBoHoN new functions and services. What's more, RoBoHoN can grow to accommodate more natural communication with the user by learning the user's profile and usage situation," it added. The phone was developed in collaboration with Tomotaka Takahashi, Project Associate Professor at the University of Tokyo's Research Center for Advanced Science and Technology and CEO of robot development company Robo Garage Co., Ltd. The device supports LTE and 3G networks and is currently being rolled out in Japan. The company has already started accepting pre-orders for the device and says it will only produce 5000 units a month. In conjunction with the product launch, an official RoBoHoN website provides users with cloud services and information on connectivity, product warranty, and how to reserve and purchase RoBoHoN. 1. Humanoid robot can walk on two legs and be operated by voice commands. 2. Compact enough to carry and use almost anywhere. 3. 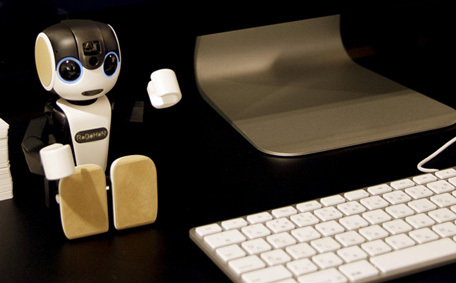 In addition to all the basic mobile phone functions such as phone, e-mail, and camera, RoBoHoN has a projector for showing photos and videos the user has taken. 4. By downloading dedicated apps, users can expand the range of functions and services RoBoHoN offers.